Apple is letting Siri work with applications made by other companies. Apple Music is getting a new interface. Apple is making it easier to use Apple TV with a new version of its tvOS. Apple kicked off its annual software developer conference with an artificial intelligence upgrade for Siri, its digital assistant, as well as new software features for other devices and an overhaul of its music service. CEO Tim Cook opened the event with a moment of reflection for the Sunday mass shooting in Orlando, Florida. He called the shooting a “senseless, unconscionable act of terrorism and hate aimed at dividing and destroying,” and noted that Apple makes a point of celebrating its diversity before asking the crowd to rise and take part in a moment of silence. Artificial intelligence, personified by the wisecracking Siri, is starting to play a larger role in Apple’s future plans. On Monday, Apple announced that the voice-controlled assistant will work on Mac desktop and laptop computers, where it can locate files and perform other feats. Siri will also gain new capabilities withApple TV, where it will let you launch live TV viewing with voice command and search YouTube and the iTunes store for videos. Such AI features are emerging as a major new tech battleground, one where Apple is racing to catch up with other virtual assistants from Google and Amazon. Amazon’s assistant, Alexa, is enjoying a surge in popularity, partly because it works well with a variety of other applications. Experts say the changes could make Siri more useful to consumers and help Apple learn more about its users. But it could diminish use of Apple’s homegrown apps, such as Apple Music or Maps. Now, users might ask Siri to open a competitor like Spotify. With AI, “systems get much better the more they know about the user,” said Alan Black, an expert in voice-enabled technology at Carnegie Mellon University. Apple collects plenty of data from its users, but hasn’t previously “focused on connecting all the dots,” said Raj Singh, co-founder of Tempo AI, an artificial intelligence startup acquired by Salesforce.com last year. Apple, however, has long been reluctant to pry too deeply into your personal information. And some experts say that puts it at a disadvantage compared to Google, which has compiled vast quantities of data – about both individual users and consumer trends – from its search engine, Gmail, maps and other well-liked online services. Apple, however, is eager to keep users engaged with its own apps and services, and announced several redesigns aimed at making them more useful and less complicated. 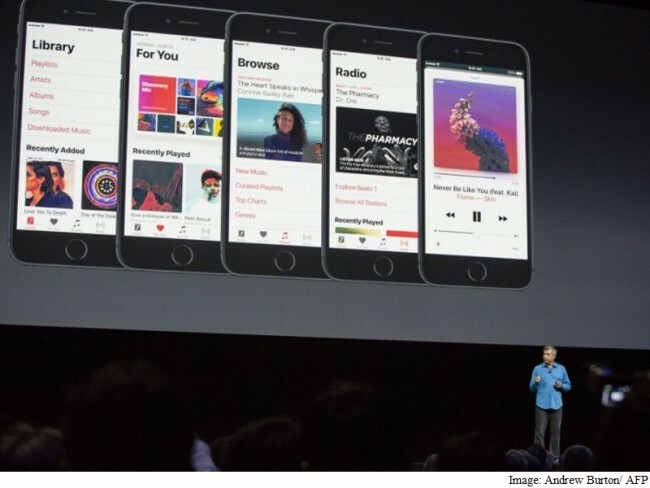 Apple Music, which now has 15 million paying subscribers, is getting a new interface that’s intended to be simpler and that will make it easier to find music you store on your phone, and not just tunes you can stream from the Internet. The company also opened its once-maligned Maps app to developers, with the goal of enabling a range of easy-to-use features. Senior vice president Eddy Cue says the new app will let you find a restaurant, book a reservation, request a car from Uber or Lyft and pay for it using Apple Pay, all without leaving the Maps app. Apple is also making it possible to subscribe to various publications like The Wall Street Journal and read the stories inside the News app. News alerts from your favorite outlets will also pop up on your device’s lock screen. Apple’s watch, the company’s first new product since Cook replaced co-founder Steve Jobs in 2011, is getting an upgrade in September that will bring fitness tracking to wheelchair-bound users . The retooled watch software will include an “SOS” feature that will automatically call for help in emergencies and the ability to share exercise activities with other people. It will also launch software apps faster than before. Apple is making it easier to use its Apple TV set-top box as the new hub of a digital home. The new version of its tvOS system software will let you sign in once to access channels from several different TV network providers. It’s also adding services like Dish’s Sling TV and Fox Sports Go. The company’s digital payment system, Apple Pay, is coming to the web. The service already lets people pay in stores without opening a separate app, by holding their phone or watch near a reader. Apple says users can now use their phone’s fingerprint sensor to pay and check out when they are shopping online using a web browser. Google brought a similar feature to Android Pay last month. Apple says it will soon expand the service to Switzerland, France and Hong Kong. It’s already available in the US, the UK, China and a few other markets.